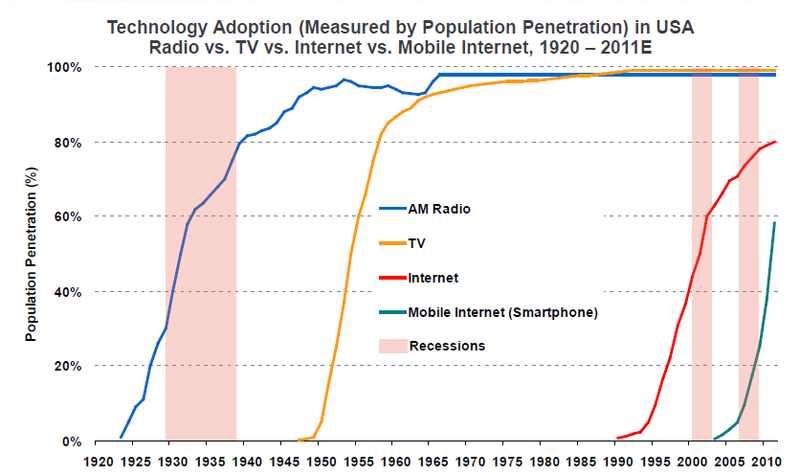 Many of us already have smartphones and those that do not will likely own one in the next year or so. Here is some interesting information from a recently published article in CNET, interviewing Marc Andreessen, general partner for the venture firm Andreessen Horowitz. Mr. Andreessen is an American entrepreneur, investor, software engineer, and multi-millionaire best known as co-author of Mosaic, the first widely-used web browser, and co-founder of Netscape Communications Corporation. Further supporting this incredible growth is the following technology adoption curve from Mary Meeker at Kleiner Perkins, one of the leading VC firms on the planet. Right now we are all comfortable with text search but search has already taken on new forms, such as image search, QR (Quick response) codes and through new services such as Pinterest, which lets you organize and share all the beautiful things you find on the web. People use pinboards to plan their weddings, decorate their homes, and organize their favorite recipes. You can browse pinboards created by other people. Browsing pinboards is a fun way to discover new things and get inspiration from people who share your interests. So now you can also search for specific items of interest within the “context” of your search criteria. This is really advancing quickly! All of this infopower is now in the palm of your hands. A very powerful way for all of us to become smarter, more knowledgeable, buy the right products and importantly save money for our lives. Now you are the one in control! Let me know what you think of this blog by commenting below.